If there is one thing I like more than breakfast it is pizza. So the obvious solution is to combine the two. 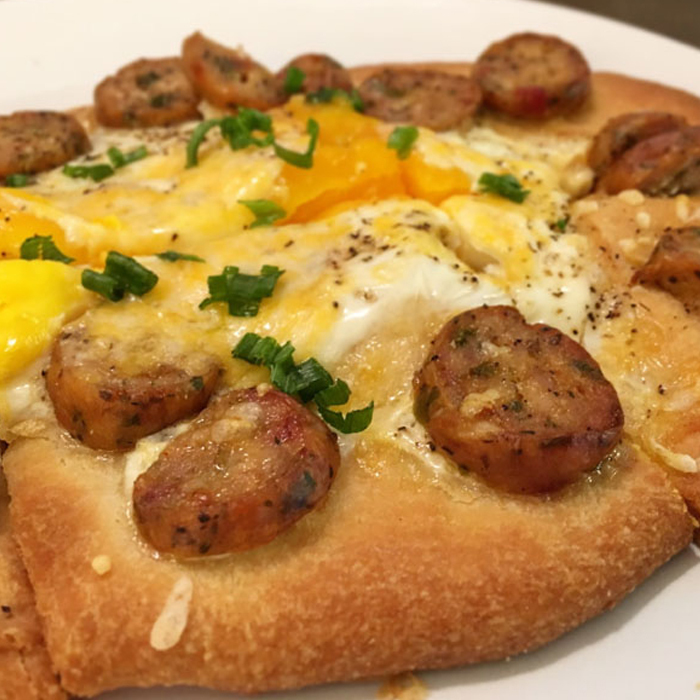 This recipe combines eggs, sausage, a little bit of cheese, and our Pastamore Rosemary with Roasted Garlic Dipping Oil. This recipe would also work well with bacon, but the sausage dose a good job keeping the egg in place. If you have issues with the egg running off you can lightly cook them in a pan for the bottom of the whites to set. Just be careful not to overcook the egg. The yolk should still be slightly runny. 1. Preheat oven to 400° F with pizza stone in place. Slice sausage into 10-12 pieces. 2. Carefully remove stone from oven and place naan onto stone. Add the Pastamore Rosemary with Roasted Garlic Dipping Oil and spread evenly. Place the sausage around the crust. Crack both eggs into the center of the crust and season with salt and black pepper. 3. Cook until eggs are not quite set and top with shredded cheese. Return to oven and cook until egg whites have set. 4. Remove from oven and top with finely chopped chives.